I’ve said it before and I’ll say it again, in my humble opinion, Messi is the greatest footballer of all time. Yes, better even than Maradona, certainly better than Pele, and better than Ronaldo in the current era. Lots of people have been getting rather excited about Messi’s performance in Barcelona’s 3-0 victory over Bayern Munich in the first leg of the Champions League semi final. Messi was sensational but then he’s almost always sensational. The truly exceptional thing about what he did to Bayern is that by Messi’s standards it wasn’t particularly exceptional. The late swing to Barcelona in the match produced a margin of victory which was as unexpected as that achieved by the Conservatives in the UK general election. Apparently Luis Enrique’s future at the Nou Camp is uncertain despite his side being on course for a treble this season. Perhaps if the role becomes vacant, Ed Miliband can apply and test out his ideas of ‘pre-distribution’ in La Liga. Distributive justice is a big issue in Spain right now with the Spanish football federation announcing this week that the league will be suspended from the 16th May owing to a dispute with the government, primarily over TV rights. Let’s hope that it’s resolved and we’re not denied the chance to watch some more of Messi. Ahead of the game, Pep Guardiola suggested that “there is no defence that can stop Messi” and his defence literally fell over themselves in proving their coach right. 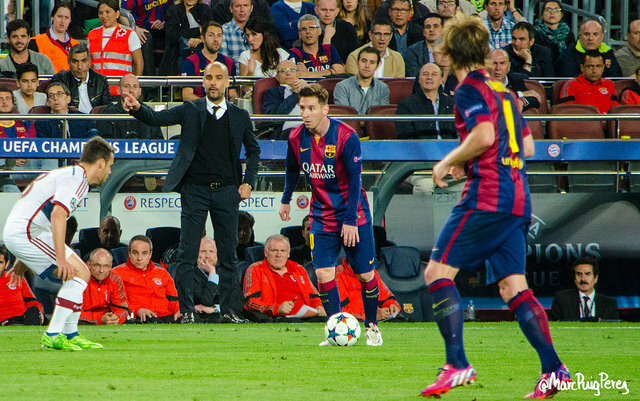 Guardiola is not the sort of coach that would build his tactical plan around stopping Messi; Bayern attacked throughout and sought to put Barca on the back foot. Eventually however, Messi had the opportunity to put defenders on the back foot and once he’s done that the defensive task is a near impossible one. Recovering the tie now looks like a near impossible task for Bayern. I can see them winning in Munich, I wouldn’t even be that surprised to see them score three goals, but I would be very surprised if they manage to keep a clean sheet. Bayern have already won the Bundesliga and are on course for their third consecutive domestic double. They currently sit 14 points ahead of second placed Wolfsburg in the league. They are in danger of becoming so dominant domestically that the step-up in competition at this stage of the Champions League will come as an increasingly significant shock to the system. I’m a great admirer of German football and it has long been held up as an exemplar of equality but Bayern are one of the global super clubs and they are leaving domestic rivals (most notably Borussia Dortmund this season) far behind. Consider that in Scotland, Celtic have clinched the title and are currently 11 points ahead of second-placed Aberdeen. The gap at the top of the Bundesliga is larger than the one in the SPFL without Rangers. My prediction for the second leg is that Bayern will win but not by enough to go through. I’ll go for 2-1. Messi will probably score for Barcelona. In the other semi final Juventus achieved an impressive 2-1 victory over Real Madrid. Italian football remains in a relatively poor state but getting a side to a Champions League final for the first time since Inter in 2009/10 would be a sure step in the right direction. With Napoli and Fiorentina contesting Europa League semi finals this week, we may be witnessing a gradual renaissance for Italian football. Juve’s performance had plenty of impressive aspects to it: they were comfortable in possession, quick and dangerous on the break, and full of confidence in their game plan. There are still many people (especially in the UK) who retain a view that Italian football is boring, largely because they consider it unduly focused on the defensive arts. It’s a bit like those who were full of scorn for Mayweather’s ‘defensive’ victory over Pacquiao (I was supporting the Pac Man too) while not appreciating that it was Floyd who both threw and landed more punches. Real certainly lost the fight on points but they are far from knocked out. Much has been made of Gareth Bale’s lacklustre performance and the Welshman is in danger of becoming something of a scapegoat in the Spanish capital. He’s just returned from injury and while he had a poor game it was part of a poor overall team performance. Ancelotti retains great faith in Bale and he’s right to do so. A drop in form and confidence can happen to any player (even, occasionally, to Messi – remember the latter rounds of the World Cup last summer?) and Bale is both experienced and mature enough to handle it. He has become more technically accomplished in Madrid, adding greater finesse to his immense pace and power. He is a player you would still rather have on your team than lining up against you. With an away goal and only a single goal deficit to overturn, Bale and his teammates will approach the second leg with enough belief that they can reach a ‘Classico’ final against Barcelona. There’s nobody better at defending a lead than the Italians but the Bernabeu is no easy place to do it. I’m a little torn on this one; I’d love to see a Classico final but my love for Italian football, even though I’m a Roma rather than a Juventus fan, means I would be far from disappointed if the Old Lady remains standing after the second leg. I suspect she’s headed for a fall though and I predict that Real will win the return 2-0. The Champions League final will be played in Berlin on the 6th of June. Whichever teams make it, I think we can look forward to a classic. Especially if Messi is playing.